This fall my husband and I hosted friends for our 20th college reunion, a celebration of some of my most treasured, life changing friendships. Needless to say, when Tree Classics invited me to kick-off their Treasured Celebrations blog hop, I knew that this was exactly what I would share with you as we head into Thanksgiving… the beauty of gathering friends and creating memories, along with approachable menus for feeding a crowd and simple décor ideas. It doesn’t have to be complicated. For real! I’m laughing a bit as I type this because prep for our Homecoming gathering was a little crazy & complicated. But, that’s because we did a full remodel on our main bath this summer, our master bath is currently gutted and one month out from friends arriving, we started a DIY update of our basement bath. Ha! I will share these bathroom remodels in future posts, but let’s just say, I wouldn’t recommend this level of home improvement this close to a major event. However, it was a huge impetus to keep moving and get work done. And miraculously, with much thanks to my husband, a handful of college students, and local friends who pitched in last minute, we got most of it done. On the inside, I hung this Classic Fraser Fir Wreath. Again, this is another wreath that works well from fall to Christmas. I added this Thankful sign that a dear friend recently gave me. I love little reminders sprinkled about the house, and truly, I am thankful. Thankful for decades of friendship, and the bounty that comes from gathering with those we love and cherish. Classic Fraser Fir Wreath from Tree Classics. I added the Thankful sign from Hobby Lobby. For table décor and food, I often employ a few strategies. First, I look to the season. It’s fall so I pull in the rich colors of the season, thus pumpkins, squash and gourds. Also, I often buy flowers at my local Kroger—they have great prices for roses and sometimes I even find great prices on discounted flowers. Second, I shop my house. After years of party planning and hosting, I’ve collected quite an array of cloth napkins. I’ve even made some of my own as well. 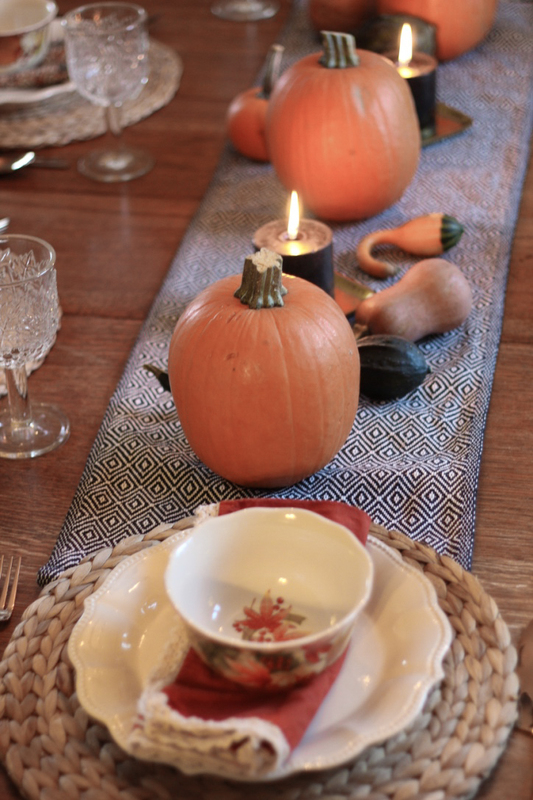 And I layer my dining table with a runner, seasonal décor, placemats and mix & match dishes. 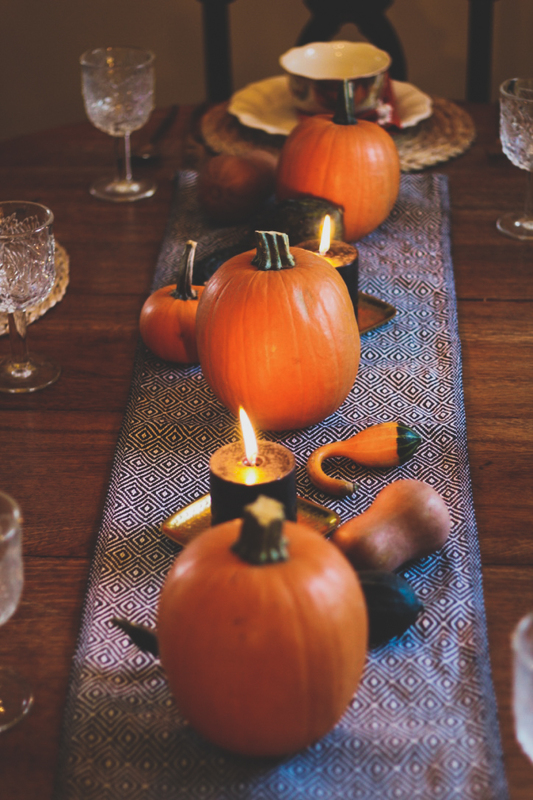 Fall harvest tablescape—table runner & placemats from Ikea, plates from Pioneer Woman (Walmart), print napkins and silverware from World Market, bowls and burnt orange napkins from HomeGoods. Dining table as it gets darker outside. Loving the pillar candles from Hearth and Home collection at Target. We host friends and family. A lot. Often, I am quickly throwing together a dinner party, but when I hatched the idea to invite a dozen friends to visit for Homecoming weekend, I knew I needed to be organized in planning—many friends were coming from a distance (East Coast, West Coast, and even Europe!). I couldn’t potluck this shindig. Though I did enlist help from a close friend who also happens to be Italian and a fantastic cook. No joke, she made homemade lasagna (noodles and everything) and traveled 2 hours with them on ice along along with a delicious Italian Cassata cake from Mannino’s Bakery in Detroit. She also brought Italian bread and real deal mediterranean olives and parmesan and Romano cheese from a speciality grocery store. I promise, I did make a few things—homemade meatballs, salad, and steamed green beans (I really like the French green beans from Costco, also great for feeding a crowd). I think we’re all more likely to host if we say yes when people ask to help. Obviously, this doesn’t work when people are travelling on planes or super long distances, but when in-state friends asked if they could bring things, I said yes. And it was a huge help to me—fresh fruit, even bottles of wine, snacks from Costco and Trader Joe’s (places that I can’t readily shop) were a great addition to the festivities. Side note: We’ve lived in a small town for the last seven years, and there are so many things that I love (living close to everything—school, work, friends, church—you really develop daily community in a way that is more challenging in a bigger city). But, I do miss the Cleveland food scene. Specialty grocery stores, bakeries and ethnic food that I took for granted, oh how I miss you! When feeding a crowd, I often choose desserts that are plentiful and not overly complicated. As I’ve mentioned before, we’re nearly 90 minutes from the nearest bigger city (Ann Arbor is my go to) and so buying desserts is not a great option for me). Thus, my friend carted a cassata cake all the way from Detroit for our Friday dinner! For Saturday evening, I had my mom make the Pioneer Woman’s chocolate sheet cake. Everyone always loves a bit of chocolate, and this recipe feeds a crowd. PSA: Along with Ina Garten, the Pioneer Woman is one of my go to’s for recipes. She cooks for a crowd, people always enjoy her recipes and they’re mostly fail proof! Don’t believe me, check out Jennifer Garner’s#PretendCookingShow. By the way, I want a pretend cooking show! 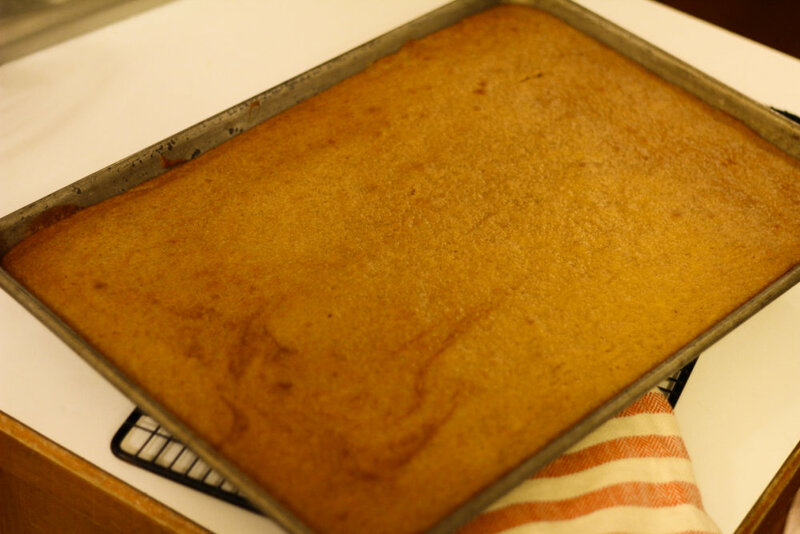 A friend who lives in town brought these Pumpkin bars (seriously, I have made this recipe three times since last month). Delicious and not labor intensive. It reminds me of pumpkin roll, but easier. No trying to gingerly remove from the pan, cool and roll. Just fill pan with batter, bake, cool and frost! Pumpkin cake—I wish I had a better photo. I promise, it feeds a crowd and is delicious. Way better than the photo depicts. Pumpkin cake topped with cream cheese frosting. As October is quickly drawing to a close, holiday prep is on many of our minds. From décor to menu planning to strategies for getting the house in order, it can seem like a daunting task. I think it’s often so overwhelming many of us choose not to do it. But my encouragement for today is that yes, it requires some extra work, but gathering friends and family over the years has been the most rewarding “work” I have ever done. Don’t let your house or fear of feeding a crowd keep you from gathering people. Memories and friendships really do begin around the table. Thanks again for Tree Classics for sponsoring this blog hop, Treasured Celebrations. Starting next Monday, October 29th, these other bloggers will be joining me, sharing their home decor and fall traditions: Emily of smallstuffcounts.com, Monday, October 29, Kathy of uptodateinteriors.com on Tuesday October 30th, Kendra of joyinourhome.com on Thursday, November 1st, and Kaitlyn of @freshandvintageliving | freshandvintageliving.com on Friday, November 2nd! And of course, I would love to hear about your fall gatherings and traditions! Celebrating our 20th college reunion & 24 years of friendship! So thankful for these women and the rich heritage we have built. 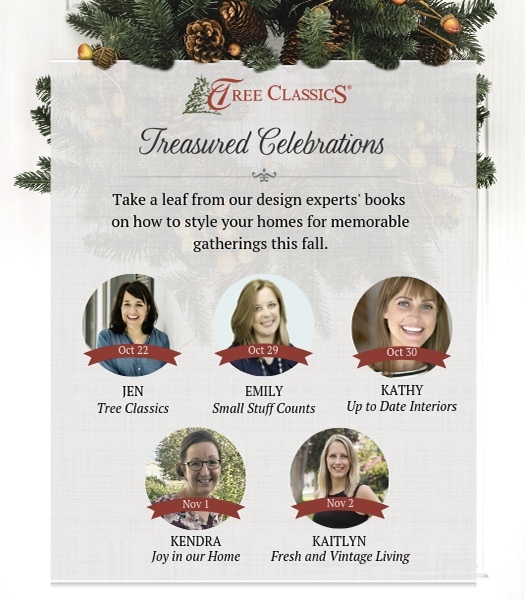 Join us as tree classics kicks of the holiday season with our treasured celebrations blog hop! Each of us will be offering our design ideas for creating a welcoming fall home.